NEHRU SNOOP ON FAMILY MEMBERS OF SUBHASH CHANDRA BOSE. DID HE SURVIVE THE AIRCRASH? 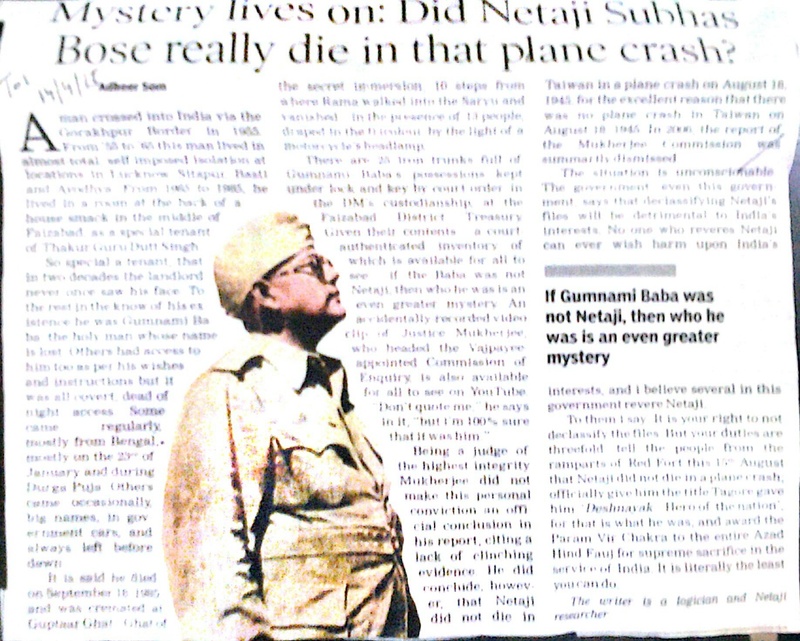 Mystery deepens today on Subhash Chandra Bose. For who was Gumnami Baba? Read the full column till the end and the two newspaper clippings appended. Everything needn’t be proved. The world can as well live, with unproven stuff. For there is no scientific proof that God exists. Yet the majority on planet earth, believes in some form of God. Arising, purely out of faith. And ‘faith moves mountains’ as the saying goes. Post Subhash Chandra Bose’s air crash some believed he was dead, and some felt he was alive. In Lucknow there was a strong buzz, that Subhash Chandra Bose is alive and in solitary confinement near Ayodhya, and this how the story goes. ‘When I was young and in a school in Lucknow. There were rumours galore that an old ‘Baba’ stays near Ayodhya in a secluded ‘mutt’ and that he is Subhash Chandra Bose in hiding. And that many senior political leaders and government officials often come to see him but no civilian is allowed to meet him. So, then, who was he, if not Subhash Chandra Bose? This was a common hearsay in Lucknow, Faizabad and even Ayodhya around late sixties and early seventies. The veracity of this story can be traced back to some intelligence archives of the UP Government. But the moot question remained, why was Subhash Chandra Bose in hiding? And, to that we were told that Government of India had an unwritten understanding with the British, after independence. That ever in future. If Subhash Chandra Bose was found alive post the air crash on 18th August 1945. He would be handed over to the British Government for his secessionist acts. Where, the only punishment would be ‘capital punishment.’ But Government of India could not have handed over, its worthy son of the soil to the Britishers, even if clandestinely committed. So, when Subhash Chandra Bose was found alive, after the air crash he was kept under house arrest, and in hiding at a secret location in Ayodhya. And, later after some years there were rumours that the baba had died. Whether proven or unproven. There is no smoke without fire and such issues where the masses are not at rest keep simmering off and on. Read the article by M.J. Akbar on Nehru snooping titled. “Some Fire Smouldering Within Smoke.” Appended above.